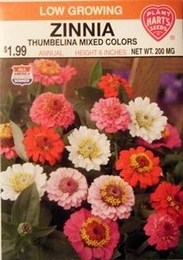 Zinnia - Thumbelina Mixture, Zinnia elegans. Unique dwarf plant perfect for edging or borders. The 1 1/2 inch blooms are of many colors and always neat and compact, with old flowers hidden by new growth. The button like flowers bloom all summer long. Zinnias prefer warm weather, rich soil and full sun. Water as needed by soaking ground around plants. Thinning - when plants are 2-3 inches tall thin to 10 inches apart.